I love DIY and crafting projects, especially when I’m re-designing items and making them my own. When I was looking for a skateboard I couldn’t find any designs that appealed to me. They were all geared towards younger boys and there was a lack in neutral or girly designs to pick from. I decided to take matters into my own hands and re-design a skateboard to match my personal taste. I decided on a subtle Harry Potter theme with a metallic background and black detailing. 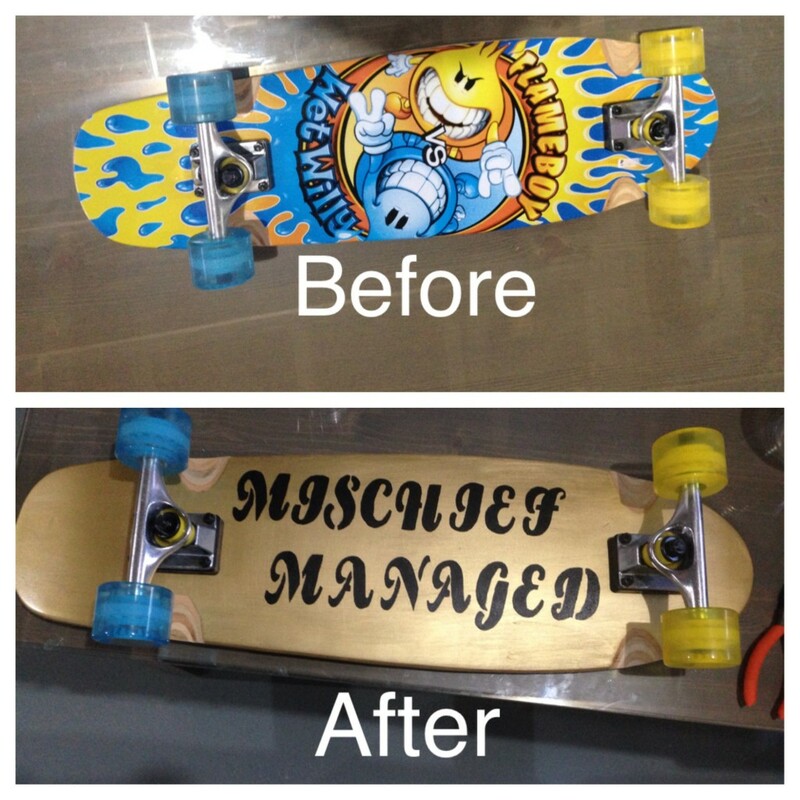 It wasn’t very difficult to customize this skateboard, but it was well worth the effort. I started by removing all the hardware from the board (wheels, screws, etc). I then sanded down the board so the image doesn’t show through the new design. I probably could have skipped this step, but since it was such a bright detailed image I thought it was better to be safe than to have to re-do it later. I then cleaned off the bottom of the board with some soapy water and left it to dry. Next, I took some painter’s tape and taped off the screw holes and the side of the board. This allowed me to still have the wood-grain effect on the side of the board and prevented the spraypaint from marking the top of the board. I then sprayed 3 thin coats of the gold spraypaint and allowed it to dry overnight. The next day I used the stencil and acrylic paint to make the design on the underside of the board. Once this dried I sprayed 3 thin coats of the laquer over top of the design to seal it and make it more durable. When everything was fully dried I re-attached the wheels and it was ready to ride. I thought this was a really fun project and now I have a customized board that looks awesome. This entry was posted in Crafts/DIY Projects and tagged crafts, DIY, skateboard by Sarah. Bookmark the permalink.